When I mentioned the big plans I had over the holidays to attempt making my own puff pastry dough, I had morning buns on the brain. Alas, the sun was too inviting and I decided to play with puff pastry another day. I still had morning buns on my mind though. This recipe, if you can even call it that, is embarrassingly simple: a sheet of puff, some butter, cinnamon and sugar. 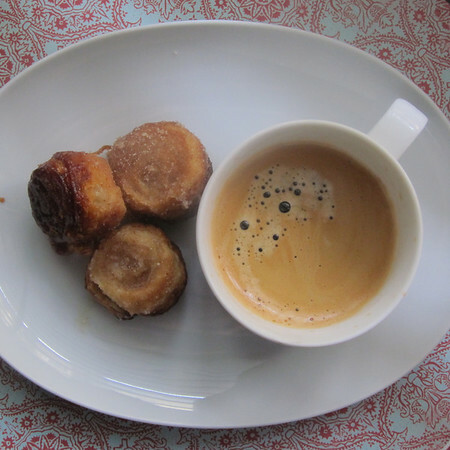 Then, right out of the oven, an additional dip in butter and a final cinnamon and sugar bath (sort of like these french doughnuts). I took these little darlings to work along with the Jesuites. Someone very important in my organizations who had the ability threatened to fire me if I ever brought them in again. I think this means they were a hit. Preheat oven to 400 degrees. Butter your muffin pan. Combined sugar and cinnamon in a small bowl until cinnamon is thoroughly distributed. Taste and add-more spice as desired. 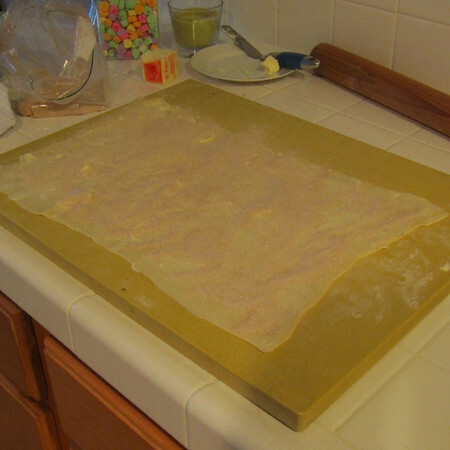 On a lightly floured work surface, roll out the puff pastry dough until about 18X10 inches. 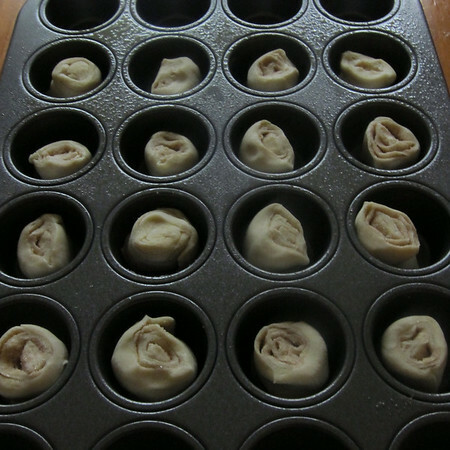 Be sure to life the dough after each roll so that it does not stick to the surface. Spread a thin layer of butter over entire surface of dough (it will take about a stick of butter, maybe a little less). Generously sprinkle cinnamon-sugar mixture across the buttered surface, reserving at least 1/3 of a cup. Starting at the far long end of the rectangle, roll the dough tightly all the way to the edge of the closest long end. The finished product will look like a log. If using a mini-muffin pan, cut log in half and then cut each half into quarters and half each quarter so that you have 16 small rolls. If using a regular muffin-pan, cut the log in half and then each half into thirds. Carefully place each cut roll into the wells of the pan, cut side facing up. You may want to squish the dough down a bit to get it to spread-out in the well. Bake until dark golden brown (20 to 30 minutes–begin watching at 20). While buns are baking, melt remaining butter. Remove from heat and transfer to a small bowl. Remove buns from oven and let sit for 5 minutes. 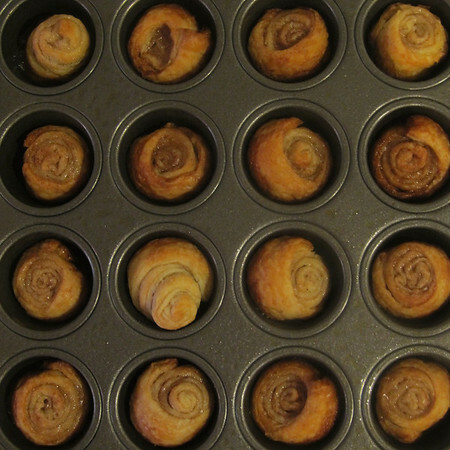 Using tongs (or your fingers if you are brave), remove each bun, dip it in butter, roll it in the remaining cinnamon sugar mixture and set atop a cooling rack to cool. Try not to get fired from your job.